Can you confirm these amateur observations of Acontias breviceps? Type locality: Hogsback, Amatola Mts., 6000 ft elevation. Types Syntypes: AMG = Albany Museum, fide FITZSIMONS 1943: 250; (3 specimens), fide Broadley & Greer, 1969. 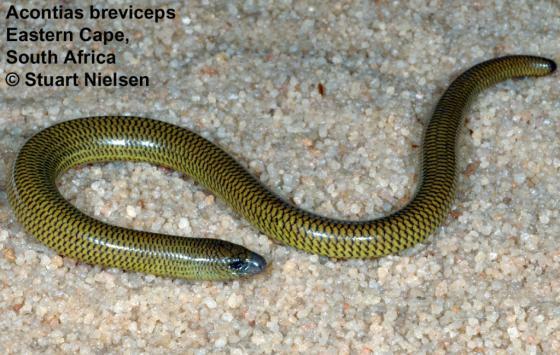 Comment Erroneous spelling of A. brevipes? (see GREER 2001). Etymology Named after Latin “brevis, -e” = short and “-ceps”, a short form of “caput” = head. Essex, R. 1925. Descriptions of two new species of the genus Acontias and notes on some other lizards found in the Cape Province. Rec. Albany Mus. 3: 332-342.